December break – I always find it difficult to zero in on a destination, much less a hotel, for this infamous “Christmas break”. It never fails – by the time I start looking, almost a year out, I either get “sorry, 10 day minimum over Christmas” or “sorry, we’re fully booked that week”. The past few years I have had the added complication of trying to find a location that would suit a multi-generational vacation. 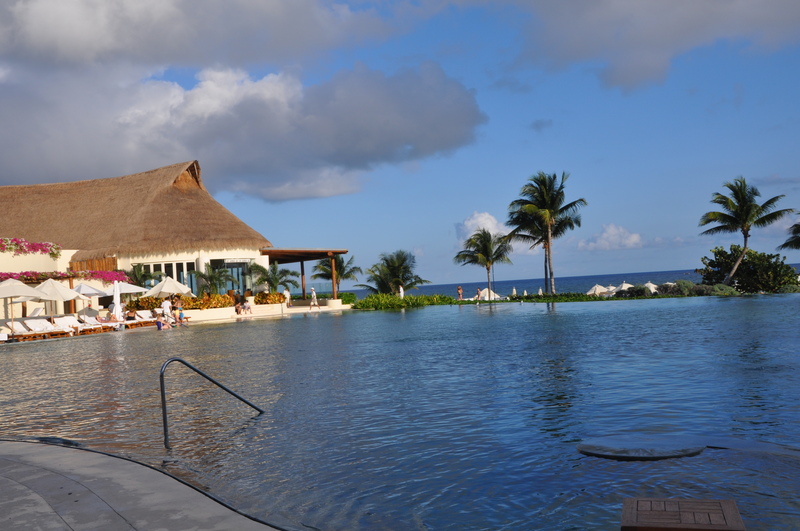 After checking into a number of options, we decided on Grand Velas in the Mayan Riviera (http://rivieramaya.grandvelas.com/). It looked nice, got great reviews, was easy to get to, and was one of the more reasonably priced options we found at this time of year. I had heard that it was like the Four Seasons of all-inclusive hotels but I was admittedly concerned about its immensity. The 500+ room property was a significant departure from the boutique hotel I had initially envisioned. Nonetheless, I was looking forward to escaping the blustery NY winter for a week. 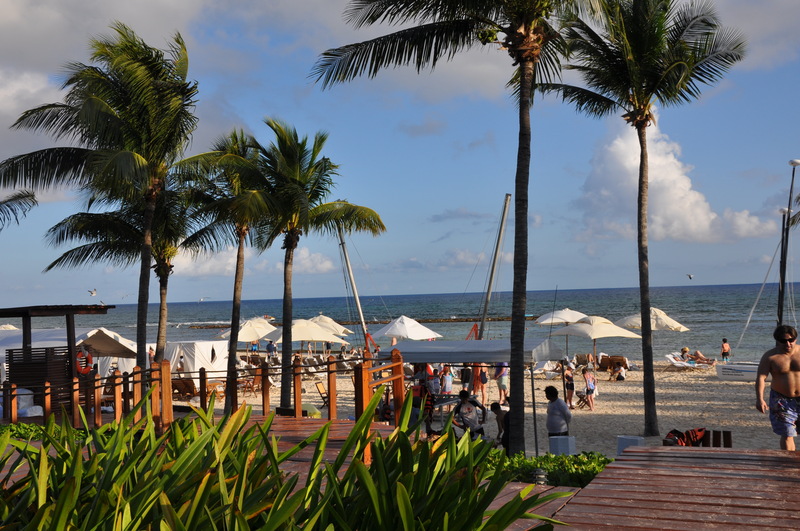 The 3 1/2 hour Jet Blue flight from JFK to Cancun is a no brainer (http://www.jetblue.com/). A pre-arranged van was waiting for us just outside baggage claim to take us to the hotel. Just forty minutes later, we arrived at the hotel through a mammoth entry and I immediately realized the owners of this hotel were not fooling around when they chose its name. EVERYTHING at Grand Velas is enormous. The reception area of the Zen Jungle (inspired by the surrounding Yucatan jungle) section of the hotel boasts a dramatic and beautiful thatched roof that must be 60′ high. Given the number of rooms in the hotel, I was impressed by the warm welcome of a concierge who knew our names the moment we arrived. After greeting us with refreshing juices and cool scented washcloths, he explained a few details about the hotel and escorted us to our room through a lush pathway surrounded by jungle. Our room was very nice – modern, simple and spacious, with a small terrace. My husband and I shared a room with our three children. Despite the room size, given the layout (a large rectangle – no separate living room area), it was challenging to have a conversation or keep a light on until after the kids fell asleep. However, we did use a hotel babysitter for three of the seven nights we were there, and that worked out well. Aside from the Zen Jungle, where we stayed, the hotel has two other sections – the Ambassador, located on the beach a very short shuttle ride from Zen Jungle, and the Grand Class (adults and children 12 and up), located directly beside the Ambassador. The van that shuttles guests from one area to another is very easy – never more than a minute wait and pleasantly clean, cool and relaxing. Each of these areas has a pool and multiple restaurants. The Zen Jungle’s pool felt Asian-influenced to me – clean lines, surrounded by lush landscape, infinity edge. It is much quieter than the Ambassador pool, which is right next to the beach and is the hub of activity. The Ambassador pool has a swim-up bar and tons of organized activities for kids throughout the day. One of our kids’ favorite activities was a seal show. Another fun family activity was a nature walk through the property’s gardens, where you get to see all the vegetables, fruits and spices the hotel grows and uses in its restaurants. We missed a bunch of activities but I recall the schedule included a juggling show, magic show, pirate-themed dinner and a traditional Mexican dance show. In the evenings there is karaoke for kids and adults. And I would be remiss to omit the kids club, which is clean and has programming throughout the day and evening. My daughter loved walking there by herself in the afternoons to get a break from the sun. The beach is really nice but it was super windy when we were there and not so conducive to swimming with children. In terms of activities on the beach, there are a variety of boating activities such as wave runners and catamarans, as well as beach volleyball, a small soccer area, and bungee jumping for the younger set. There are seven restaurants on property, not including the bento box lunches you can have delivered to your lounge chair if you are so inclined. The food was good everywhere, although if you are looking for a barefoot beach vibe with mariachis, margaritas, guacamole, salsa, chips and tacos (like we were! ), you may be disappointed. The closest we came to satisfying that craving was the fish tacos and guacamole available to the pool lounge chairs. One incredible convenience at Grand Velas was our personal concierge, Osiris. Although we had made dinner and babysitter reservations in advance of our trip (recommended, especially if you’re going during a school break), Osiris checked in with us daily to review and confirm, and modify, if necessary, that evening’s dinner plans. He also answered any questions, made sure we were satisfied with our stay and checked us in for our flights when it was time to leave. My breakfast preference was Azul because of its well stocked buffet and location overlooking the beach. I also liked Azul for lunch, or the bento box option at the Zen Jungle pool. For dinner my favorites were Frida, Bistro, and Piaf (order the grand marnier souffle for dessert here!). The evenings we ate at Chaka and Lucca were partially buffet style, which was fine but I would probably skip them next time around. The service was incredible everywhere – attentive, accommodating and so polite. If you have time, the spa is definitely worth checking out. It is so huge that the staff recommends 40 minutes, at a minimum, to experience the thermal baths. Our massages were just okay, although the setting was so serene I would give it a second try. All in all, we had a wonderful and memorable week. Grand Velas is in many ways perfect for multi-generational travel because it really has something for everyone and has the space to accommodate big groups. The biggest disappointment for me is that we only left the property once, to go to Playa Del Carmen (which was just okay). I would have loved a daytrip to Tulum (about 45 minutes by car) and one to Chichen Itza (closer to 1.5 hours away) at the very least. There are a number of other daytrip options, such as visiting the natural cenotes that this region is known for. It was difficult to motivate given the size of our group and how happy they all seemed to be relaxing poolside every day. 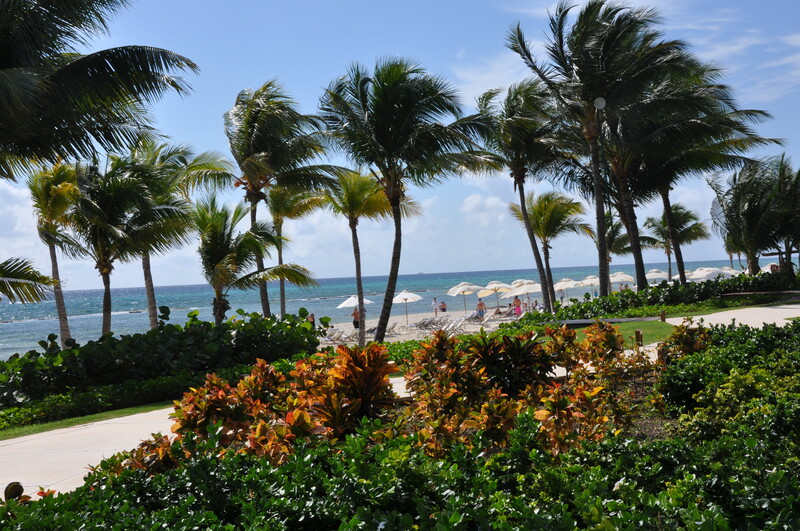 What can I say – while this vacation ranked low on the cultural immersion scale, it is a huge nod to Grand Velas that their top notch staff and amenities made the place hard to leave! This entry was posted in Mayan Riviera, Mexico and tagged All-inclusive, December break, Grand Velas, Mayan Riviera, Mexico, Zen Jungle by travelesq. Bookmark the permalink. Hard to beat the price, the short, distance to travel for fun & sun and your private concierge, which attended to all your needs . The staff, as well as restaurant waiters could not have been better!!!! This is a privately owned hotel and they do a sublime job in treating guests the way a luxury property should.💝. Travelesq truly writes accurate blogs on personally visited locations !